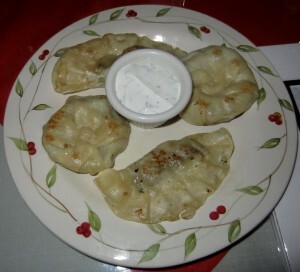 With sour cream dill sauce. Since 4 come in an order, we chose 2 beef and 2 lamb. The exterior is similar to a steamed dumpling and the inside is stuffed with a small amount of meat. The beef was pretty good, and the lamb was even better because it had more flavor. The dill sauce complemented it well, but we liked the pirogues better on their own. 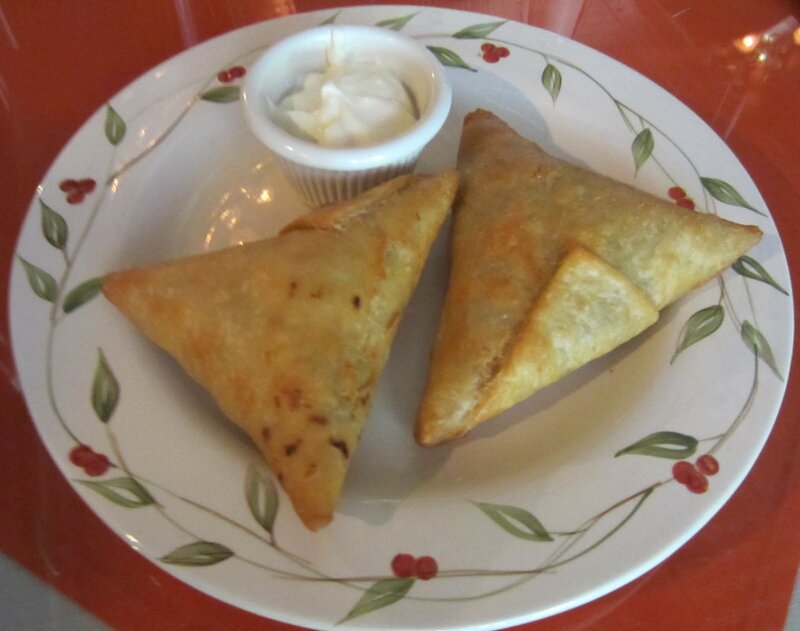 We didn’t know what to expect when saw Samosa on the menu, since it is usually an Indian dish. Uzbekistan is not too far away from India though! 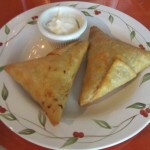 The samosa was fried and filled with potatoes and peas. It was very mildly spicy, but still a bit bland. Even though it was a small portion, the samosas were decent! 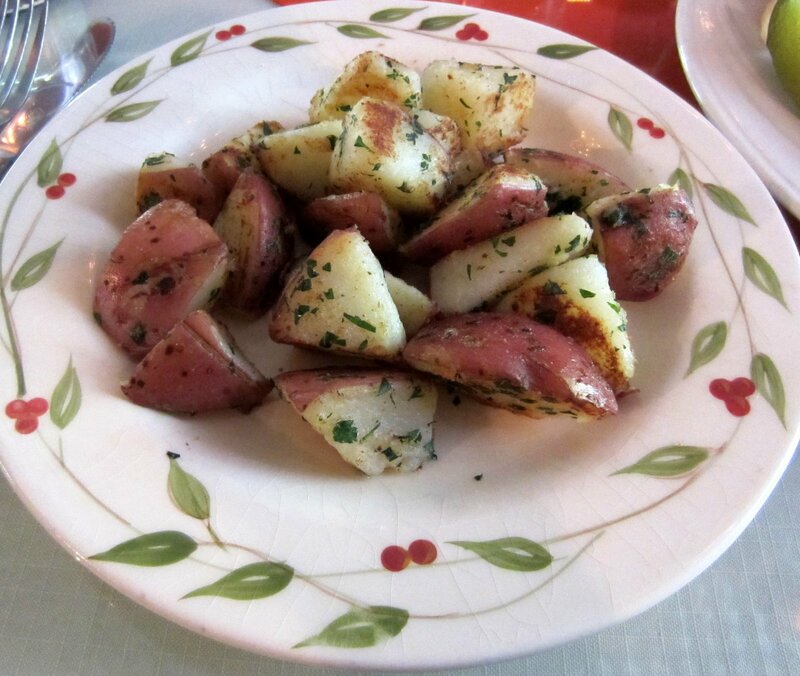 These potatoes were not enough for us so we moved on to a side item that caught our attention. 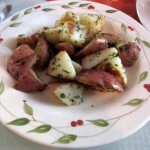 These potatoes were cooked just right and seasoned well. They were slightly spicy and the parsley was a nice touch. We’d happily order this again. 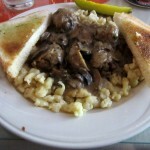 Topped with fresh mushroom sauce and served with spatzle (pasta). This was probably our favorite entrée at European Bistro. The meatballs were delicious and addictive. The mushrooms in the sauce were lovely, and the pasta underneath went really well with the meatballs. 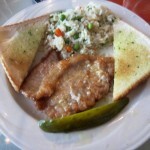 This plate also came with a tiny pickle and a thick piece of generously buttered white bread…yum! Ikea’s cafeteria serves mouth-watering Swedish meatballs with lingonberries. Try both and let us know which one you preferred more! This came out as a rectangular piece of fried cheese, and tasted similar to fried mozzarella sticks. The munster flavor was missing. It was a little boring, and would have tasted better with honey or another sauce on the side. 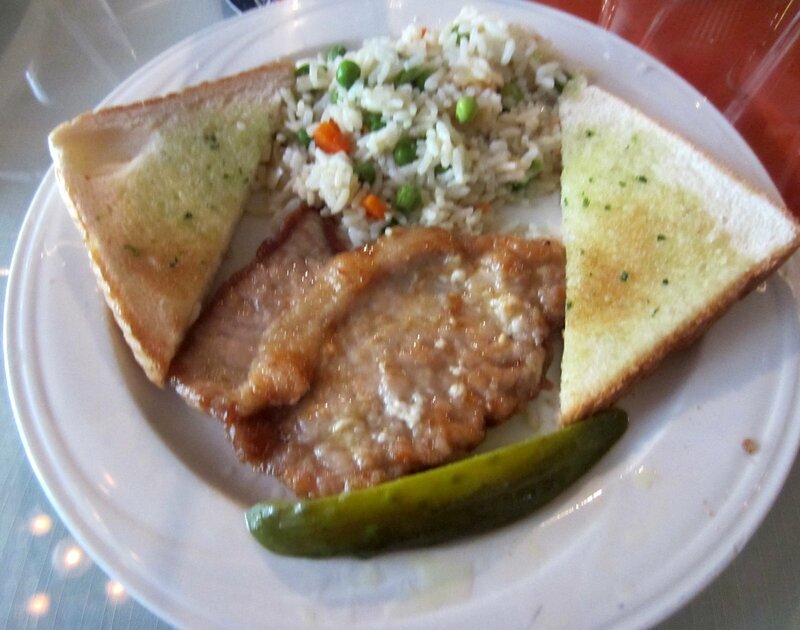 It came with a vegetable-rice mixture, a pickle, and that same delicious piece of buttery bread. There aren’t a whole lot of options for vegetarians on the menu, but the samosas were a better choice than the cheese schnitzel. Served with rizi-bizi (rice with peas, carrots, onions). Luckily, this dish was on the lunch special menu, so we didn’t spend too much money. The pork loin was thinly sliced and very chewy and dry. It was almost like eating a piece of jerky, but this had less flavor. 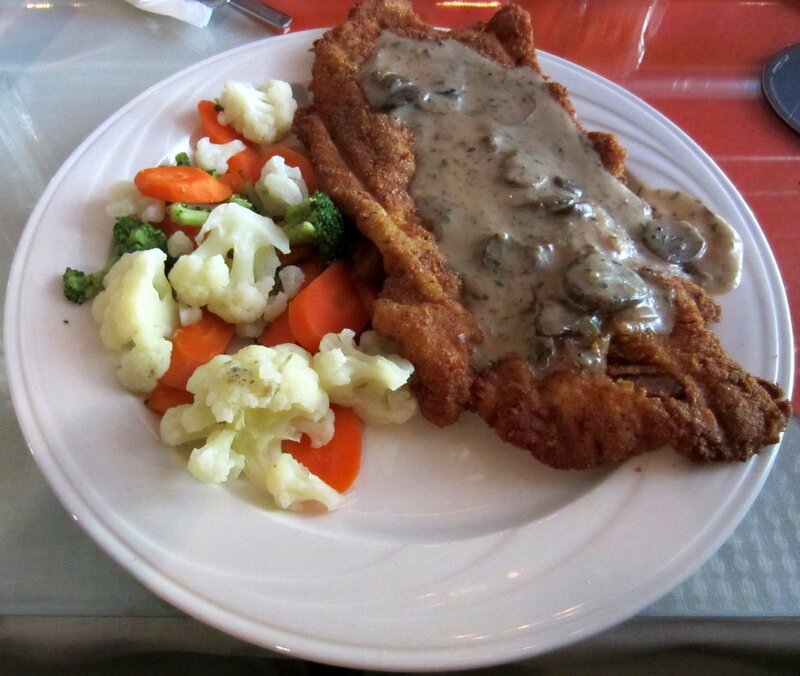 Breaded veal with a mushroom gravy. Our waiter mentioned that this is the most popular dish on the menu, so we decided to give a try. Wow, were we disappointed! 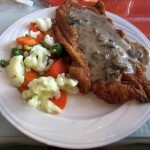 This is nothing more than a chicken fried steak, except parts of the veal were chewy and lacked flavor. The mushroom gravy helped out a bit, but you will still pay an arm and a leg for this and leave unsatisfied. 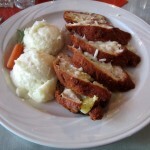 Lightly breaded chicken breast, stuffed with pineapple and herbs. This is one of their most creative and flavorful dishes on the menu. As you can see from the picture, the chicken was stuffed with a creamy-buttery sauce that was scrumptious! The pineapple was a nice complement that added a sweet dimension to this dish. 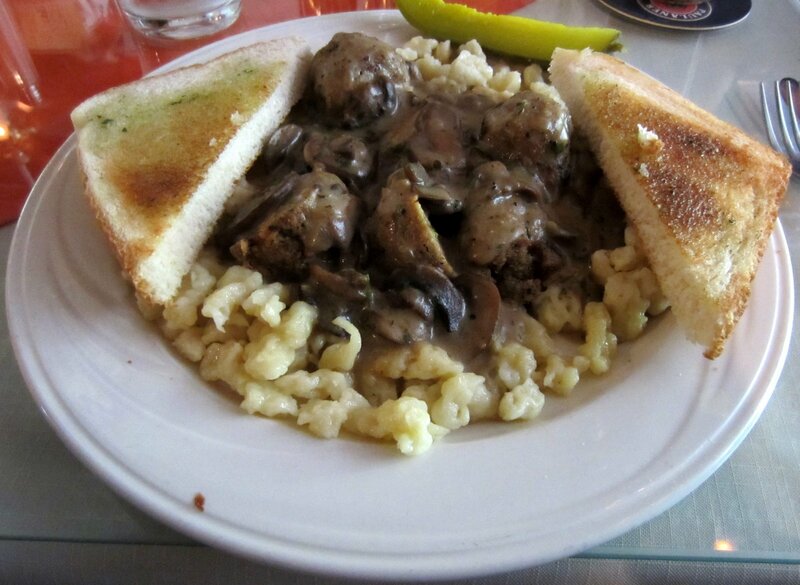 If you still decide to dine here after reading this review, get this and the meatball dish. 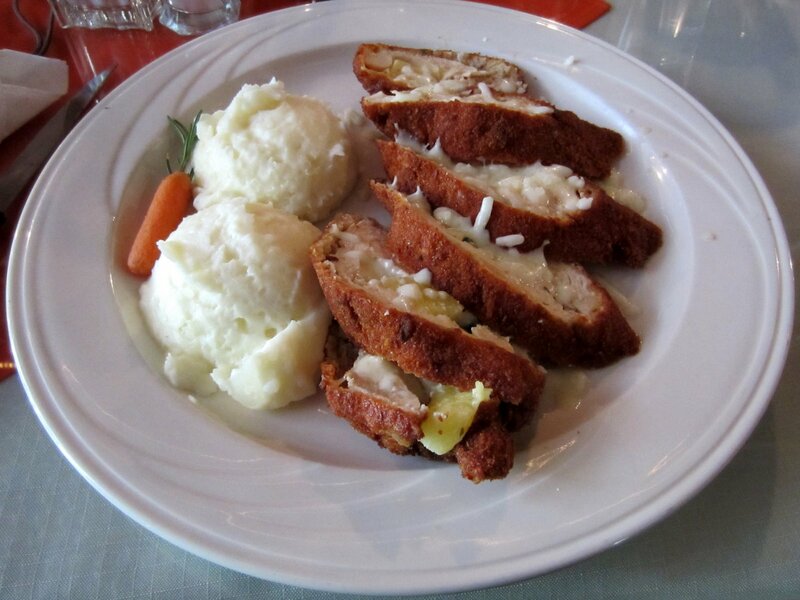 Breaded with fresh bread crumbs and served with rizi-bizi (rice with vegetables). 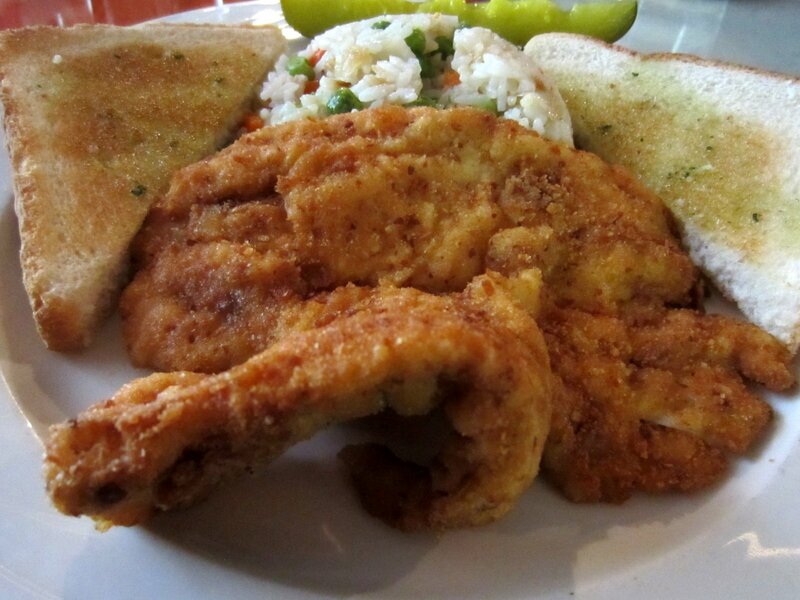 This is basically a fried chicken breast. 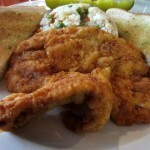 The chicken was tender and not dry and the bread crumbs were mildly seasoned. This definitely needs to be eaten with ketchup or some sauce though to break up the monotony. The rice was tasty but did not go especially well with the sauce-less chicken. 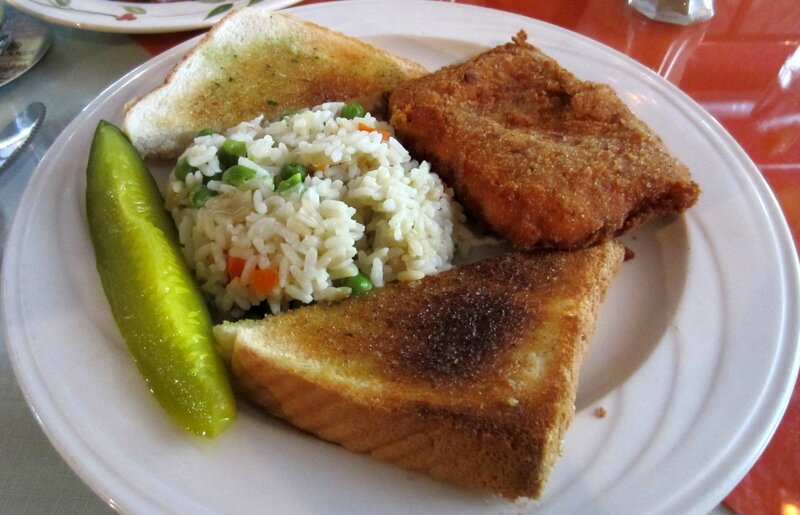 Breaded Swai fish served with rizi-bizi. 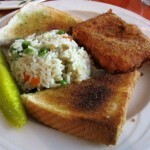 Similar to the aforementioned item, but the fish and breaded part were completely unseasoned and bland. 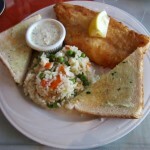 The fish was soft and cooked well, but the included tartar sauce was extremely necessary to enjoy this. 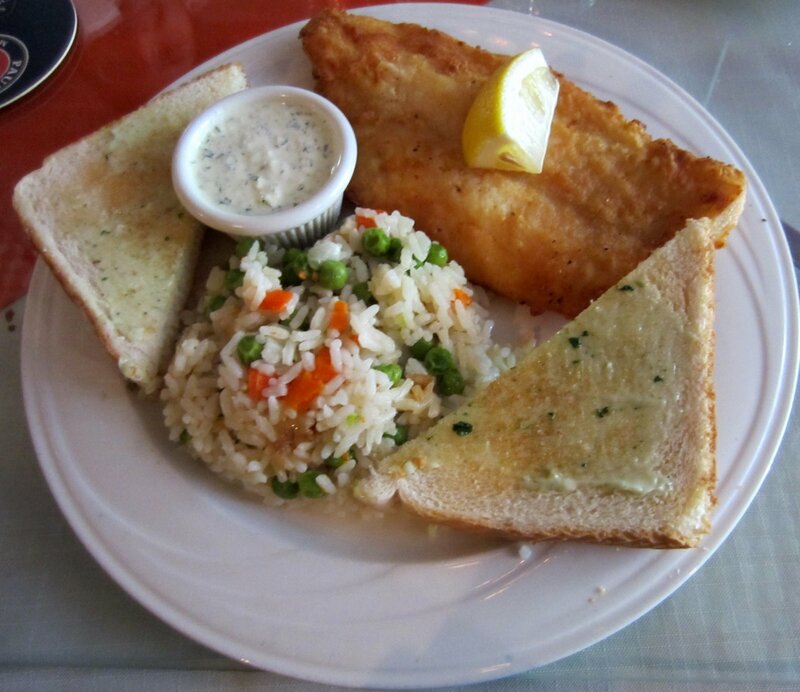 The rice and buttery bread were more savory than the fish! We made reservations for a group of us on a Saturday during lunch. It was for a special occasion, so they promised to add a few extra touches to make it memorable. We called the day before to double check and confirm everything, and it sounded like the staff was competent. Unfortunately, they did not deliver those extra touches. Our waiter was nice, but when we asked him about the special touches – he was completely clueless. Besides another small group, we were the only ones dining. There was an item on the online menu we were looking forward to trying. Our waiter told us that the online menu has not been updated in 2 years and they didn’t have that item. Our appetizers took a very long time to come out – over 30 minutes. We assumed it was because it was being cooked fresh, so we didn’t mind too much. Then our entrees took another 30 to 40 minutes. We understand (and usually embrace) the European concept of not rushing patrons and having a laid-back atmosphere, but the wait-staff did not come out to refill waters or ask if we needed anything. When we were finished eating, it took forever to receive our check, and then it took a while for us to receive our individual bills! We enjoyed the ambiance of the restaurant, but were not prepared to spend 3.5 hrs there that day. So if you have little ones with you – you might want to tell the staff in the beginning that you don’t have more than 2 hours! They did give the guest of honor a little chocolate-wafer treat, which was very thoughtful. Overall, the service could use some sprucing up and perhaps it would be busier on a weekend during lunch. European Bistro is located in the historic “downtown” Pflugerville. This type of restaurant fits perfectly in this quiet and charming area of town. When you enter the inside of the restaurant, you will feel like you are stepping into an eatery on a small side-street in Europe. The only major difference is that this place is much larger. The interior is open and airy with extremely high ceilings. All the tables have small vases with flowers and walls have traditional style paintings. Some tables feature old-style upholstered dining chairs – something you might find in a European castle. There are several semi-private dining areas called alcoves that are served for special occasions, but we found these to be a bit dark and dreary. There is also a second floor to the restaurant that has booths, There is a piano in the front of the restaurant, that is used on some nights by a live performer. This place is great for both small and large groups due to the size, and plenty of street parking is available. It is a shame that the food and service are subpar, because they did a great job with the ambiance!